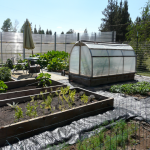 Usually I’d say you should save as much money as possible with whatever you’re buying, but when it comes to garden pathway covers, you will lose money in the long run if you go cheap. That’s exactly what happened with part of our garden plans last year. We had some heavy-duty ground cloth that we used to cover part of the walkway system, but ran out halfway through covering them. Then I found some cheap stuff that claimed it would keep weeds from growing, so I bought it and finished the job. Anyway, this year we’re doing it right. 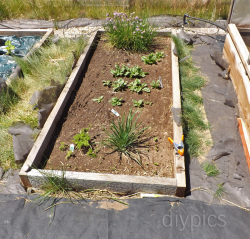 It would be ideal to tuck the ground cloth under the edges of the garden beds like we did with the original installation, but that’s no longer possible. Instead, I just laid the new ground cover over the first (after hand-trimming all the grass), and staked it down on the sides. NOW we’ve got a weed-proof walkway system! By the way, when you do lay down the heavy-duty ground cloth, DON’T cover it with mulch. The salesman at the garden center said that that defeats the function of the black ground cloth which is to absorb heat and kill anything underneath. 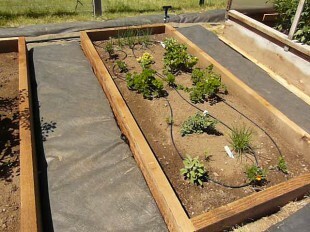 Covering the ground cloth with mulch will cool it down and allow life to thrive under it. Very good tips Marta. Life will certainly thrive under the ground cloth if you cover it with mulch! I made that mistake my first time out too. The pathways in your garden look great.